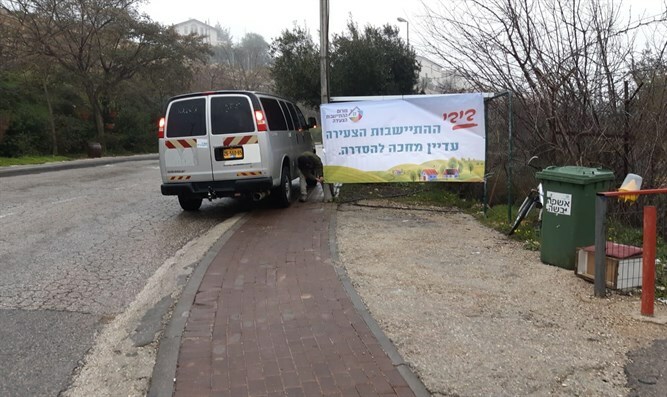 A chilly reception awaited Prime Minister Netanyahu in more ways than one when he visited Gush Etzion today in the form of protest signs hung along the entire access road to communities within council and to Nativ HaAvot where Netanyahu visited. The Young Settlement Forum that works to arrange young settlement posted dozens of signs along the route with the call, "Bibi - Young settlement still awaits an arrangement." The Forum explained, "Tens of thousands of residents are waiting for the promises from Netanyahu's previous election to arrange settlement, and we're here to remind Netanyahu that the promises have to be kept. "As a prime minister from the Right, he cannot continue to treat young settlement in the spirit of Talia Sasson and he must settle the injustice that's been going on for thousands of Israeli citizens living without basic conditions," the Forum noted. Forum members stressed, "We demand the injustice be corrected before the elections. All the tools are in his hands and we want him to use them now."